It’s been one of those days where just when you think, wow this day is awesome and couldn’t possibly get anymore awesome, then it get’s more awesome. I woke up this morning after sleeping soundly last night because I FINISHED writing my first book last night. Jude and Lexi were finally quiet since they’ve been immortalized forever on my laptop and are no longer fighting with each other, and me, to get out of my head. New characters are now pushing to the forefront, but I’m telling them to drink a beer. Or take a nap. I need a break. Editing on Alluring Turmoil has commenced and I’ve notified my Beta Readers to expect surprises come early next week. All the responses were excited and they are simply dying to read this creativeness that has come from my brain. Thumbs up. Pat myself on the back. Crank up some Fall Out Boy and jam to express my joy. Then, as I’m editing my first few chapters, I hear a nice little ping from Facebook, letting me know I have a message. It’s an author that I read, am a total fangirl for, and greatly admire and she’s giving ME kudos for completing my first book and saying how much she’s looking forward to reading it. Where’s the camera? Is this a joke? Alas, it is not. And SHE was really writing me to say congrats, wish me success, and wants to know as soon as it’s out so she can buy it. More authors that I’ve come to really love have also offered their support and this means the absolute world to me. To have someone who is already out there, established, doing what they love, and being pretty damn awesome at it, tell me that they support me and can’t wait to read it… let’s just say it’s a pretty amazing feeling. Well, picture the dance scenes from the old Grey’s Anatomy… my house this morning. Only it was just me. Makes me feel like cranking this up and going all Rocky Balboa! 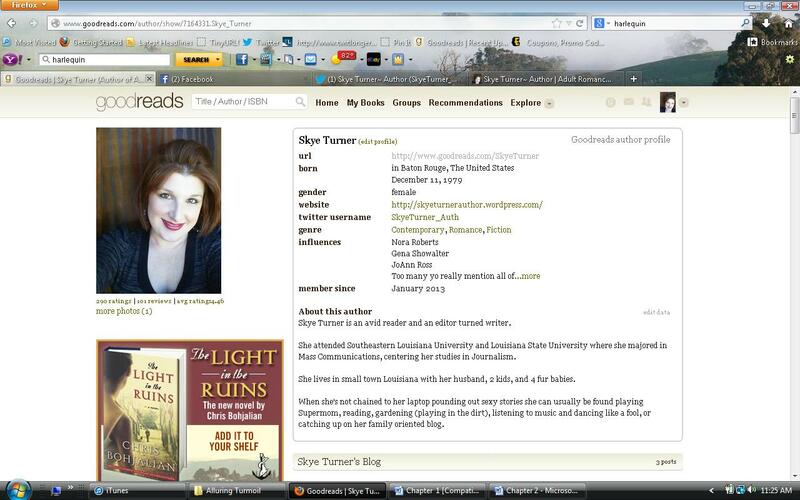 I also applied to the Author Program on Goodreads a few weeks back, and had heard nothing back as of today. I’d sent inquiries and checked to make sure it had gone through. Nothing. This morning, 3 weeks after submitting my application, I sent a slightly (ok more than slightly) freaked out message asking what the status was and if there was an issue I needed to be made aware of, and within 30 minutes, I was approved. Yeah, that right there is ME. The simply crazy thing about all of this is… maybe I’ll write these books and no one will read them. Maybe people will read them, but they’ll hate them. But maybe, just maybe people will love them. And that my friends, that’s what it’s all about! Live your dreams. Put yourself out there. You might fail. You might succeed. But without trying, you’ll never know what you’re capable of. Now, I’m off to find some chocolate! ← Keeping the Masses Happy.